This is a must have for the summer barbecues, the Monogrammed Barbecue Branding Iron. When you order it you specify the letters you’d like to brand. Then the next time the flaming coals come out you can sear your monogram onto the food, so we could have an official CG steak. If you are known to do really stupid things when drunk this is a product probably best avoided. 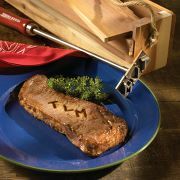 The Monogrammed Barbecue Branding Iron is available from Hammacher for $58.95.